Thank you to Entenmann's for providing me with product, free of charge, in exchange for my honest review. All thoughts and opinions shared are my own. Alvin, Simon and Theodore are back and ready for a grand adventure! 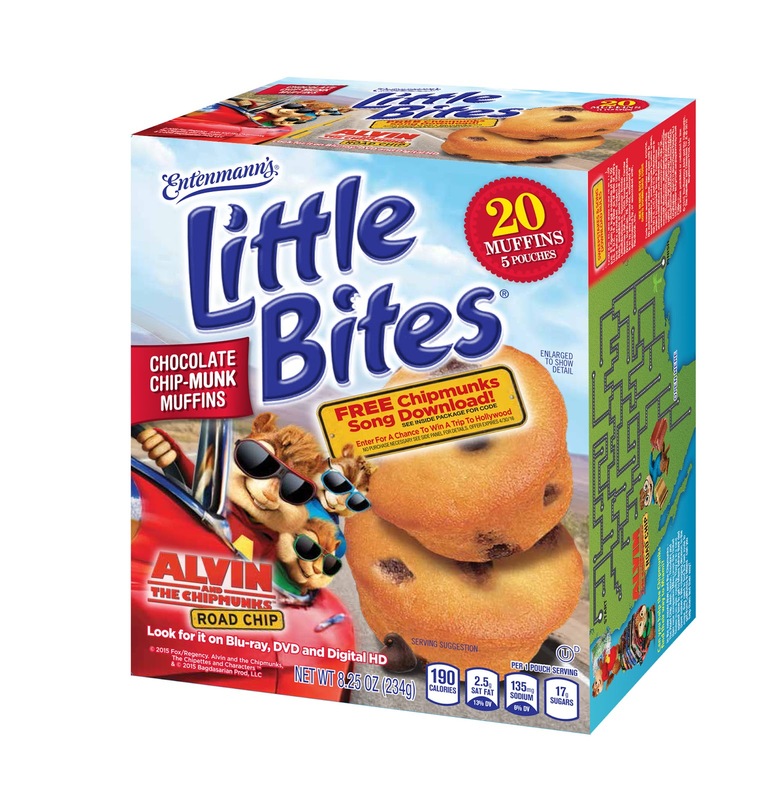 To celebrate the March 15th DVD and BluRay release of Alvin and the Chipmunks: Road Trip, Entenmann's is rolling out their delicious Little Bites Chocolate Chip-Munk Muffins! 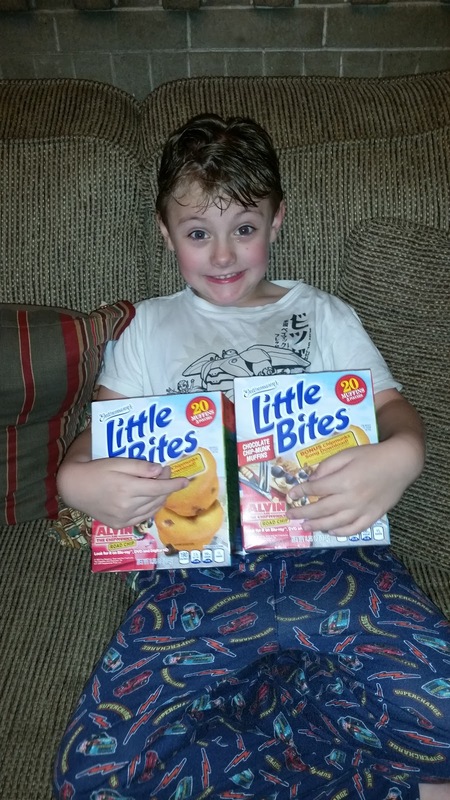 Each box of Little Bites contains 20 muffins- 5 packs of 4 muffins each. B was super excited to find a special Entenmann's surprise package waiting for him at home after her got home from school! 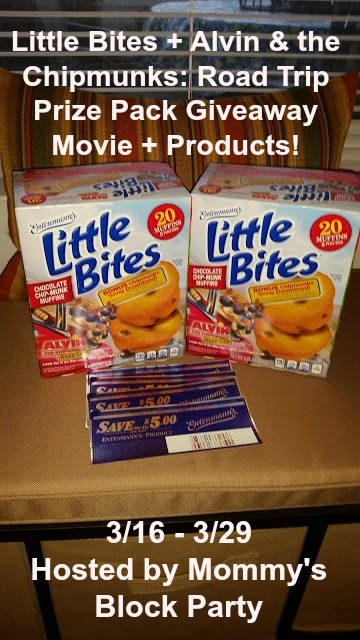 Inside of our special package from Entennman's, we received 2 boxes of Entenmann's Little Bites Chocolate Chip-Munk Muffins, 4 coupons for $5.00 off Little Bites, coloring and activity sheets, as well as a digital download code of Alvin and the Chipmunks: Road Trip. Super excited for this special treat! B absolutely loves Entenmann's Little Bites. They've sort of become a staple for our pantry. They taste great, and they are the perfect quick breakfast on a busy morning, or a great snack to take on the road! These tasty muffins are packed with lots of chocolate chips, and tons of flavor! We definitely make sure that we have some of these tasty muffins to take with us when we hit the road- whether it's for a day trip, or a vacation. As a mom, I love these tasty Little Bites, because they don't contain high fructose corn syrup, and they contain zero grams of trans fat! Definite #momwin. B was also excited for the chance to see Alvin and the Chipmunks: Road Trip. He totally loves those furry little balls of mischief. This is a fairly tame movie, though if you're strict about your young child not hearing/viewing particular words or phrases or situations, you may want to use caution. The language is in no way bad, there were just a few words/phrases I was surprised to hear, and don't want my child repeating. 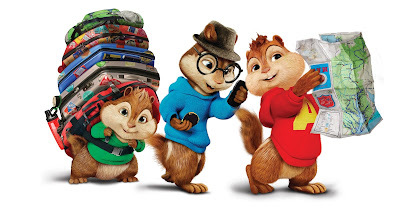 In this movie, the Chipmunks team up with their soon-to-be step-brother (Miles), traveling across the country to stop Dave from proposing to his girlfriend. The four must work together to keep their families apart. Calamity ensues, and the Chipmunks find themselves in all sorts of situations and in lots of different places- even New Oreleans, where they find themselves in the middle of a Jazz Parade! There's lots of music, singing and dancing in this movie, of course... so if your kids love music, they'll love the tunes in this movie. All in all, it's a fun family movie. With spring break just about here, this is the perfect family movie to watch before heading out on a family vacation, or while traveling to and fro! Keep an eye out for the specially marked Entenmann’s Little Bites® Chocolate Chip-Munk Muffins! 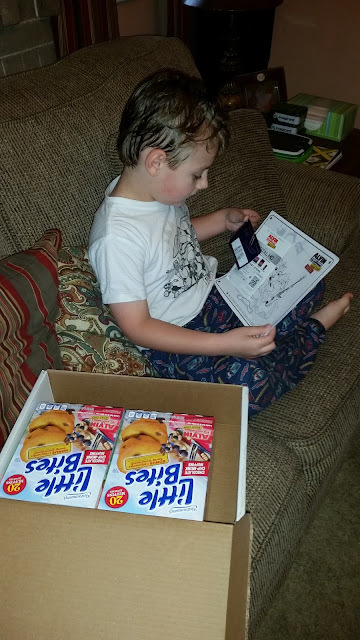 Purchase of one box includes a FREE Chipmunks song download from the movie, a fun on-box activity maze, along with a great coloring sheet inside of the box for kids! That’s not all! Starting February 15th until April 30th, fans can enter the Little Bites® “Road Chip” Sweepstakes for a chance for their family to win a 4 day/3 night trip to Hollywood, no purchase necessary. Consumers can check out all the details on the Little Bites® Facebook page. Giveaway is open to US residents, 18 and older- no PO boxes, please. Just use the RC entry form below to enter for your chance to win. MBP is not responsible for prize fulfillment. Please see our policies page for complete details. Special thanks to our friends at Entenmann's for sharing this awesome giveaway with our readers! I love the snickerdoodle or the brownie flavors. I like the chocolate chip mini muffins. I like the fudge brownies Little Bites. For me it's a toss up between the blueberry and chocolate chip mini muffins. The Raspberry Danish Twist is my favorite Entenmanns product. I like to heat it up first. The Chocolate Chip Mini Muffins are a hit in my house. The only problem is that the kids eat them too fast. I like the chocolate chip muffins! YUM!! I also like their Raspberry Danish Twist! I also like the banana muffins. they're perfect for a snack when I have to drive for a few hours. Commented at Dresses by Biscotti & Kate Mack! I also like the chocolate covered doughnuts. The only problem is that I eat too many at one sitting. I also like their banana muffins! The butter loaf cake was always a favorite of my Nana"s and she had great taste.